The Bagby Hot Springs are natural hot springs adjacent to a secluded tributary of the Clackamas River that is forty miles southeast of Estacada, Oregon. 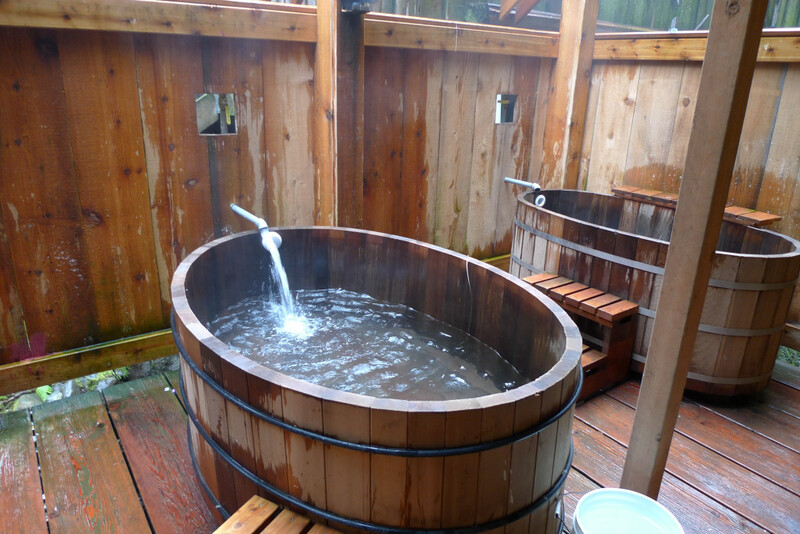 The warm water fills logs that were hewn by hand and natural wooden tubs. 1 hour roundtrip for the hike, then add soaking time! $5 per person for a if you are soaking; purchase one at the Ripplebrook Store or at the trail head. The Bagby Hot Springs are natural hot springs adjacent to a secluded tributary of the Clackamas River that is forty miles southeast of Estacada, Oregon. The hot springs are accessible by hiking only 1.7 miles from the trailhead. The warm water fills hollowed out tree trunks and natural wooden tubs. There are both private rooms with the hollowed out tree trunks and a shared area with several tubs. The springs were discovered around 1880 by a hunter and prospector by the name of Bob Bagby, hence the name of the hot springs. The hike to the hot springs is an incredibly pleasant hike through a classic northwest forest. The trail mostly follows the Hot Springs Fork of the Collawash River upstream for about 1.5 miles. If you continue up the trail a little farther to extend the hiking a little bit, you will come to a beautiful waterfall on Shower Creek and will eventually head into the Bull of the Woods Wilderness. The central bathhouse has five tubs in private stalls, which is where the logs that were hewn by hand are. 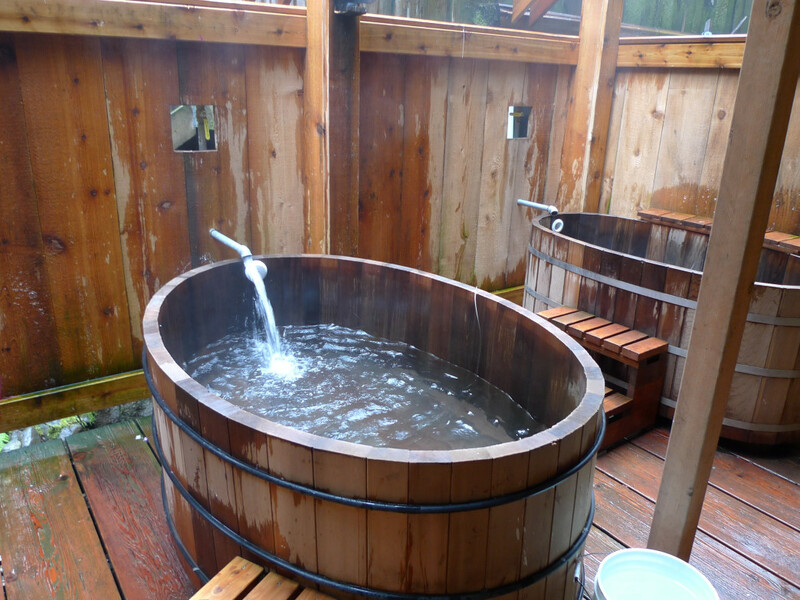 Below that, there are three log tubs and one 6-foot tub that are all in a community setting. The three central springs and several seeps that are found in this area flow at a rate of 24 gallons per minute and the water is a piping 138 degrees Fahrenheit. Luckily, there is a pool of water in a central location on the deck that is filled with cold water and buckets you can fill to empty into your tub to cool it down. The hike to Bagby Hot Springs is a flat, out-and-back trail that is 3.4 miles total, making it accessible for hikers of any experience level. Anyone can enjoy soaking in the warm tubs while looking out to the beautiful scenery of the surrounding forest. To get there from Portland, take exit 12 off of I-205 in Clackamas and drive east on highway 224 for about 44 miles through Estacada to the end of the highway. Just beyond the Ripplebrook Ranger Station, the road becomes Forest Service Road 46. Continue on that road for about 3.5 miles, the turn right on Forest Service Road 63. After 3 miles, turn right on Road 70 and drive 5.5 miles to the trailhead on the left. There is no parking fee, and there is no alcohol allowed at the hot springs. There is a camping fee of $16 a night for a single site at the Bagby Campground. There is no camping at the hot springs, but there are campsites at the trailhead. To be courteous, empty the tub and fill it back halfway so it will cool in time for whoever may be next. Occasionally, the hot springs are closed due to snow, though fall, winter, and spring are all pleasant times to visit as long as you are prepared for any conditions on the road.